Malpais Stout | La Cumbre Brewing Co.
A meal in a glass. Brewed with 7 different malts, you should be ready for a full onslaught of creamy stout intensity. Broadly in the style of a Foreign Extra Stout, this is our heaviest and most intense year-round offering. Poured from a tall boy can into a tulip. Opaque brownish-black with a 1/2" coffee colored head. Thick lacing. Decent head retention. The scent is roasty, licorice/anise, dark chocolate. Dark fruit, like prunes. Coffee grounds. Smells legit, spot on for the style. Similar tastes of roasted malt, baking chocolate, coffee grounds. Bitter licorice. Raisins more than prunes. Very bitter but rich, not imbalanced. The body comes on lush and creamy, ends bitter and dry, fairly clean. This stout is legit and true to style. Reminds me of Western European stouts I've had. Noice! Opaque black with a massive coffee-colored head, this beer throws off a soft aroma with some roast, earth and ripe dark fruit. The mouthfeel is velvety, viscous and chewy. Flavors from the seven malts used in this brew bring suggestions of black treacle syrup, cocoa, caramel, roast and acridness with a bitter and smoky linger to the palate. Thanks to La Cumbre for making an FES. We don't see many brewers doing the style these days, and Malpais Stout is a fantastic reminder of what we're missing. As reviewed in BeerAdvocate magazine #112 (May 2016). Pours a brown shade of ebony. Small tight off cream spackle colour head that dissipates pretty quickly leaving nothing but a faint galaxy swirl. Impressive lacing given the lack of head. Roasty malts with some faint chocolate and coffee. Flavour leans into the roasted grains with some char and a light creamy sweetness. Sharp pricks of carbonation help usher the bitter finish, almost giving it a spicy-type kick. Elements of dry ashy finish but then there's the creamy counterbalance to bring out the coating final word. More on the dry/char/ashy side of the stout spectrum as opposed to the rich chocolatey type, but there's a deceptive creamy character in there as well. No frills, this is just a tasty basic stout. Poured into a snifter. dark and opaque with a generous tan head. Roasty on the nose with some dark chocolate but mainly char and ash. Big flavors as expected. A nice mix of roasted malt, coffee, milk chocolate, char, and ash. The bitterness is there but really well balanced against the malt. A soft feel for such a big beer. Somewhat dry on the finish. Appearance - Pours black with cola brown edging and a tan, solid finger width head. Good retention before dying down to a thin, solid layer of suds. Good amount of lacing with broken webbing and plenty of small spots decorating the glass. Smell - Slight roastiness, chocolate and caramel. Hints of earth. Taste - Follows the nose. Chocolatey, roasted malts and lesser caramel. Cream. Just a wonderfully balanced blend of all that as it dives into the finish. Mouthfeel - Near full-bodied with moderate carbonation. Silky smooth and creamy as hell; makes this a dream to drink. Slightly dry finish. Overall - Elevated might be their best selling beer, but this is the one I'll miss the most. Great flavor rivaled by it's smooth, creamy body. Well done, La Cumbre. Huge thanks to Chico1985 for hooking me up with the La Cumbre cans. Reviewed at Pinon Flats Campground, Great Sand Dunes National Park, CO.
A- Tallboy can poured to a chalice with a midnight black body. A head forms to over a finger with a toasted brown hue and foamy creamy consistency. Head retention is fairly good and a puffy ring remains. Webs and sheets of lace coat the glass. S- Dark bitter chocolate notes almost dominate the nose for me. Dark blackened grains provide the former as malts drop notes of burnt roast grains, caramel, nuts and some sweets. Spiced dark fruits and hops beyond that. T- The fruity part of the beer picks up here with spiced raisin and fig coming to mind. The dark cocoa still shines in the forefront and comes with a deeply roasted grain bitterness. Other notes are caramel, toasted nuts, slight sweetness and cereal grains. MF- Fairly thick bodied overall with an oily and frothy texture when agitated. Carbonation at a medium level and it all finishes with a burnt roast bitterness. Very dark grains bring on a super dark chocolate feel that brings along a substantial bitterness. Drinks perhaps a bit bigger than 7.5% but still flavorful and nice as a tallboy. 16oz can poured into a snifter. L - Pours pitch black in color with a finger of creamy dark tan head with good staying power. S - Big roasted malt aroma, coffee, cocoa, a bit of charcoal and some molasses and mild hop bitterness. T - Lots of char and dark roasted malts, a touch of astringency, cocoa powder, coffee, hop bitterness, grassy hops on the finish. M - Big full body, frothy carbonation - rather foamy, very dry and bitter on the finish. Lots of char and burnt flavors linger after the swallow. Pretty big for the style. O - Very nice Export Stout. Big for the style in flavor and body. Quite bitter and burnt/roasty throughout. Decent hop bitterness. Had never heard of this one before - glad to have the opportunity to try it. Looks beautiful with black/brown body and deep khaki head. Nose is big assertive roasted grain and black coffee. Hints of chocolate make the nose pretty complex. Mouth feel is good with nice carb and body. Flavor profile is a little problematic for me. It has a lot of IPA character to me. In fact, blind I might think this was an IPA such is the assertive nature of the bitter tones - much more a hoppy bitter than a roasted malt bitter. Finish is also a mixture actually of roast bitter and hop bitter. A= Deep dark black with medium brown thick creamy head, tons of lacing rings the glass. T= Dark chocolate and roasty malts. Has bittnerness, coffee, and smoky flavors. Bit of earthy hops. M= Creamy with moderate to full body. O= Great export stout, good all around flavor, aroma, etc. 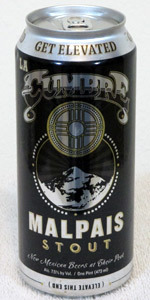 Malpais Stout from La Cumbre Brewing Co.